What is Maine Famous For Besides Lobster? What is Maine Famous For? Looking for reasons to visit New England's largest and northernmost state? Maine is known for its diverse landscapes and lighthouses, for its delicious bounty from the land and sea, for its wildlife and natural wonders, for its writers and retailers. Maine appeals to all of the senses, as it evolves season after season. Famous Maine destinations seem tailor-made for family vacations, while the state's wild, uncharted expanses invite outdoor lovers to reconnect with nature's rhythms and explore. Base yourself in Maine's largest city, Portland, and you'll be centrally located to do and see it all. Here are the 10 things for which Maine is most famous. 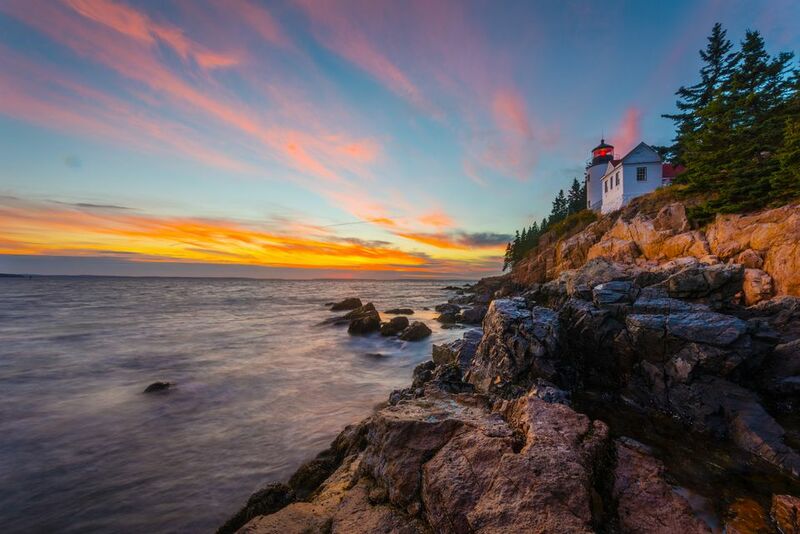 Check them all off your list, and you can say you've truly experienced the best of Maine. Homarus americanus. You may not know lobster's Latin name, but you probably know its reputation for being one of the yummiest substances on Earth! You haven't truly tasted lobster until you've devoured a crustacean fresh-plucked from the cold, abundant waters of the Gulf of Maine. In New England's northernmost state, lobster is so plentiful, you won't have to pay a fortune for a memorable feast. And nothing's more satisfying than eating lobster "in the rough" at a picnic table by the sea. Try Lobster Ice Cream in Maine... If You Dare! There are more than 60 lighthouses in Maine...each unique and storied. These coastal sentries beckon to visitors enchanted by their symbolism and scenic majesty. Some are easy to find, others remote: Visiting them all would be quite an odyssey! If you're a lighthouse lover, consider visiting Maine in September, when the annual Open Lighthouse Day takes place. The annual Maine Lighthouse Ride for bicyclists is also in September. Maine's 3,478-mile coastline is longer than California's! And while much of it is rocky and dramatic—and the waters of the Atlantic sure are cold most of the year—Maine does have pleasing, sandy beaches for frolicking in the surf in the summertime and strolling year-round. The Maine State Animal is... the moose! Maine's Department of Inland Fisheries and Wildlife estimates there are 50,000 to 70,000 of these hulking, spindly-legged creatures sauntering around the state, and boy can they eat. A typical moose consumes 71 pounds of food (mostly plants) a day! Do the math! Or, forget the calculator and pack a pair of binoculars: Moose are fascinating to observe. One of Maine's claims to fame is its 47.000-acre national park: the first national park established east of the Mississippi River. Acadia National Park in Bar Harbor is a visual marvel and one of New England's most visited national parks. Opportunities for recreation in the park range from challenging hiking, biking, and climbing to leisurely scenic driving and horse-drawn carriage tours. And a stop at the Jordan Pond House for popovers is one of the musts. Need a pair of warm, wooly socks at 3 a.m.? Enduring retailer L.L. Bean is famous for never, ever closing the doors of its flagship store in Freeport, Maine. L.L. Bean is your source for durable clothing and gear even when you're far from Maine: Free shipping and a 100% satisfaction guarantee make it one of America's most popular ​mail-order companies. Visit the L.L. Bean Flagship Store... Day or Night! If you've never tasted wild blueberries, you're in for a treat! Maine is famous for producing about 99% of the nation's wild blueberries, and these sweet-tart little blue jewels are delightful in everything from pancakes to salad to blueberry pie. Look for blueberry dishes on menus in Maine. If you immediately think of the coast when you think of Maine, you're only seeing half the picture. Western Maine is home to some of New England's most stunning mountains, and these peaks challenge climbers, hikers and skiers and call to photographers and campers. Set sail aboard a National Historic Landmark for a memorable multi-day cruise. Maine is famous for its fleet of more than a dozen Windjammers: historic tall ships that still ply the island-dotted waters off the coast of Maine, taking travelers wherever the wind dictates. If you're aching to disconnect from the workaday world, a Maine windjammer cruise may just be for you. And even if you're a landlubber, admire these boats from shore during the annual ​Windjammer Days celebration in June. The Best Place to Buy Live Maine Lobster... Cheap!